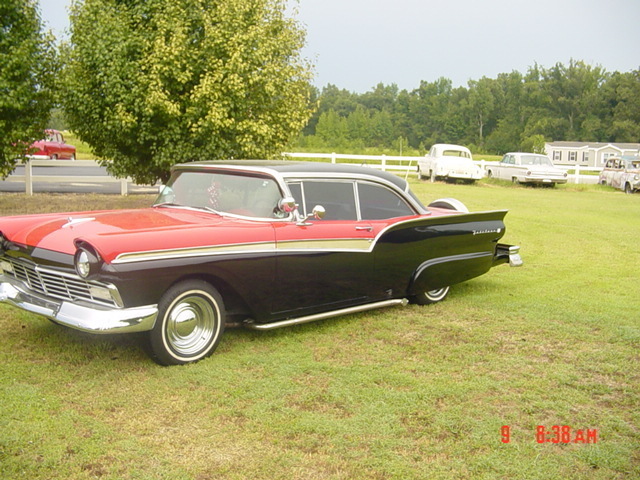 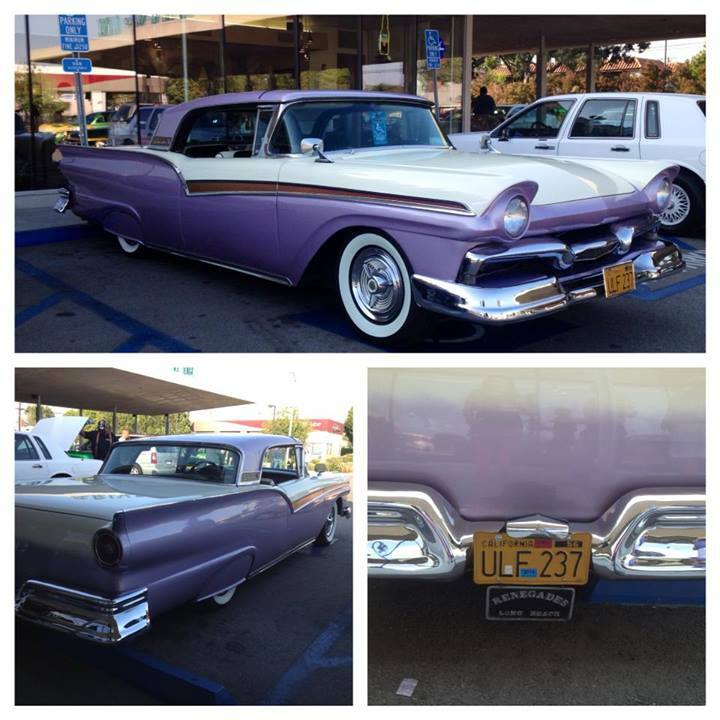 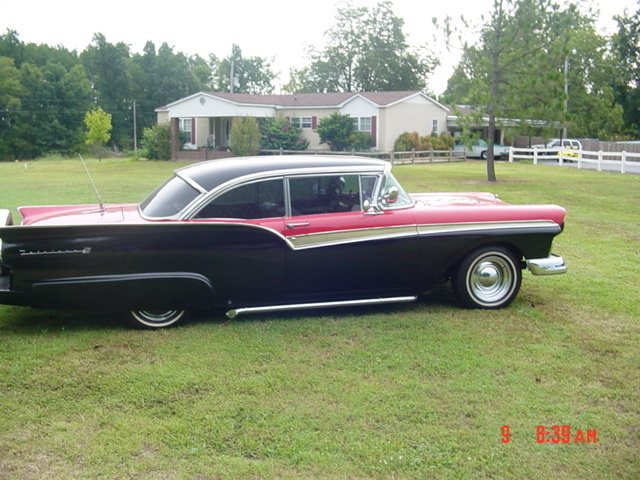 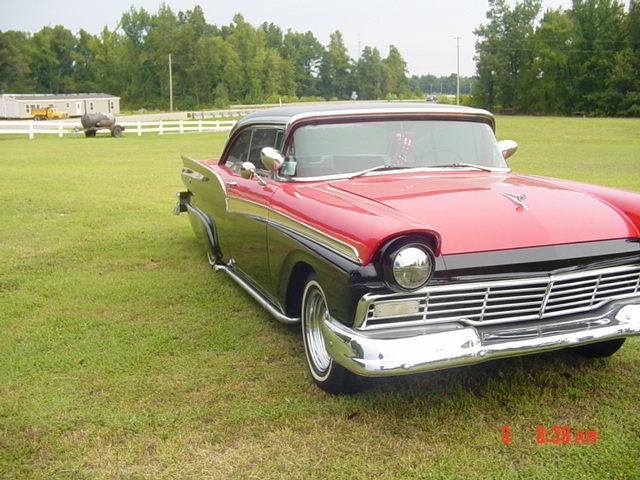 My oldest brother, Don, had a '57 Ford when he got out of the Navy in 1957. 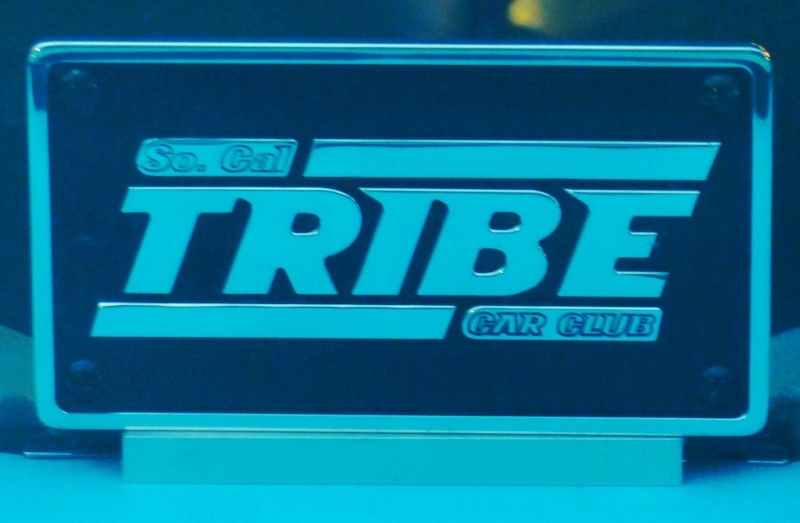 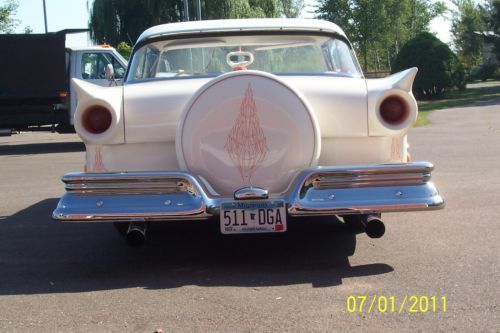 I was only about 7 years old at the time, but it was my first realization that some cars were really cool. 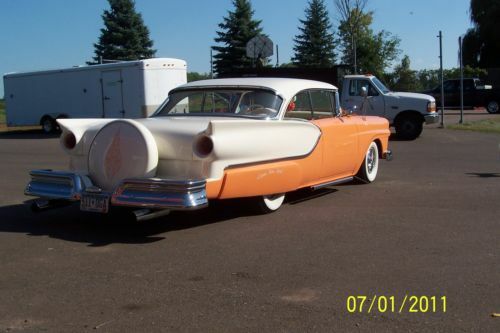 He immediately had it customized with a Continental kit, skirts, lakes pipes, and shaved emblems. 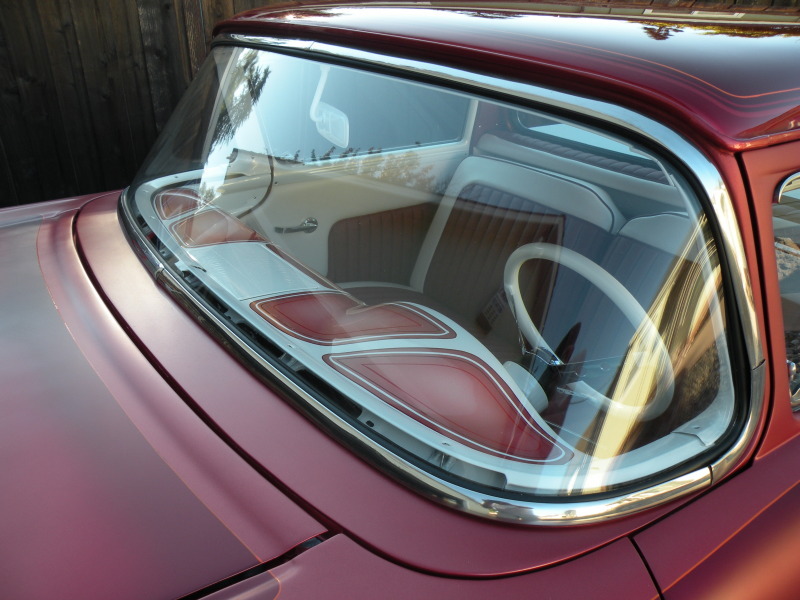 I'd been after Don in recent years to find a '57 hardtop and to let me build it for him. 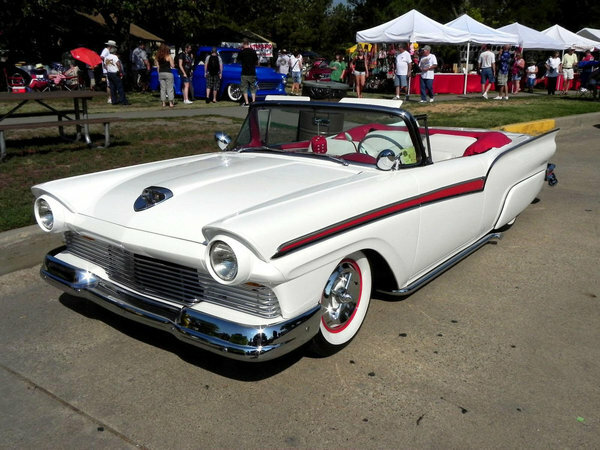 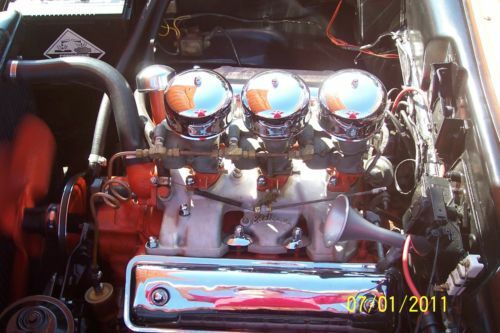 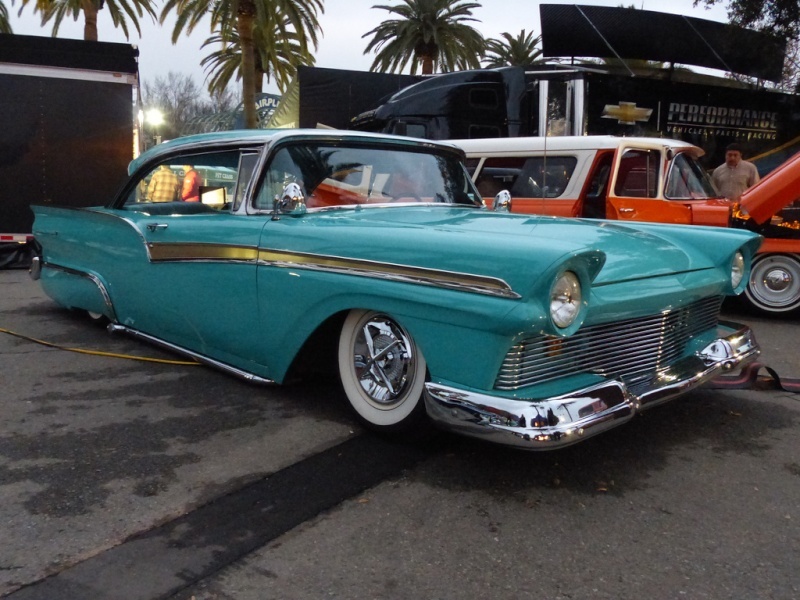 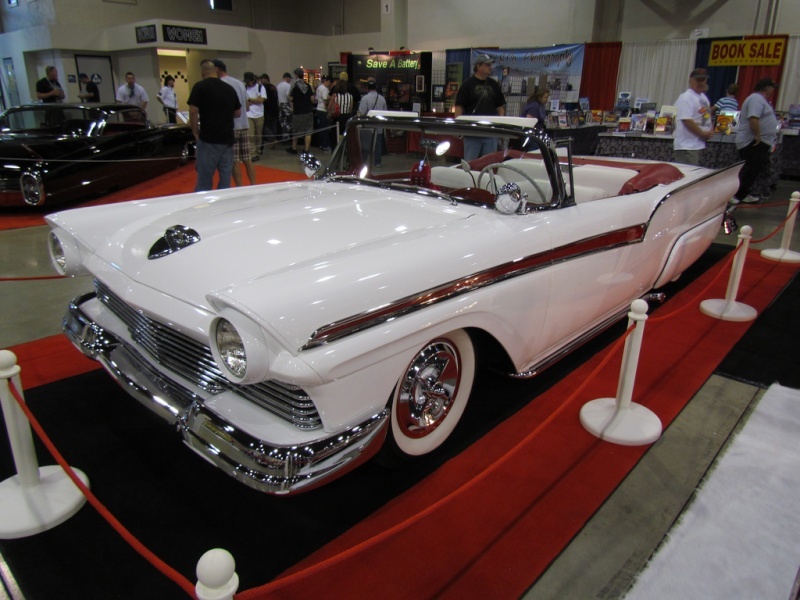 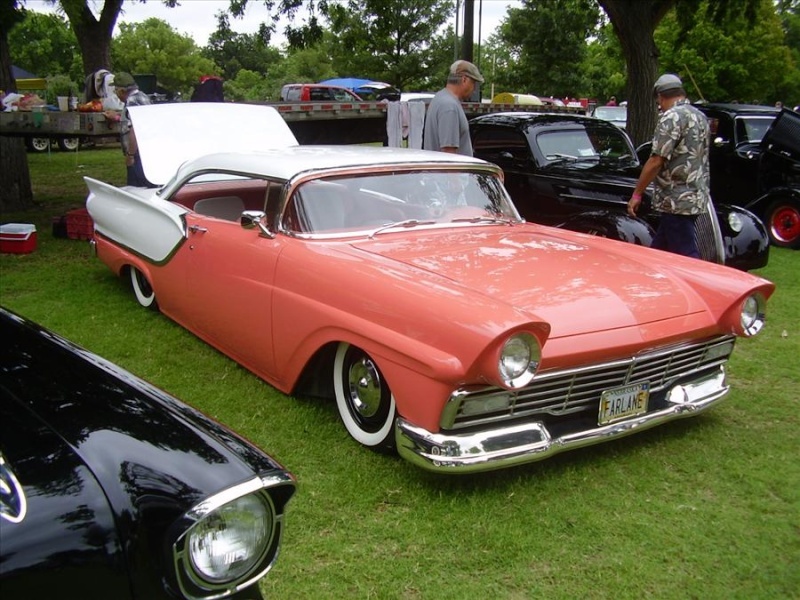 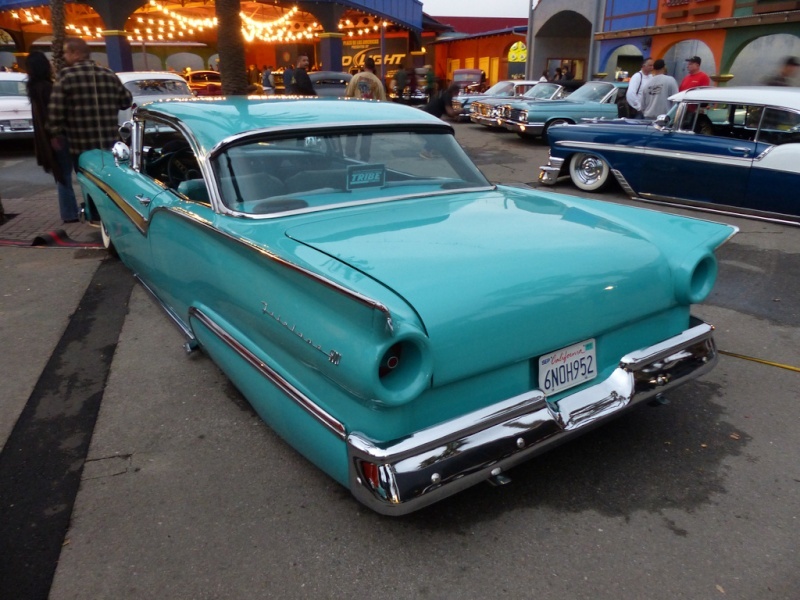 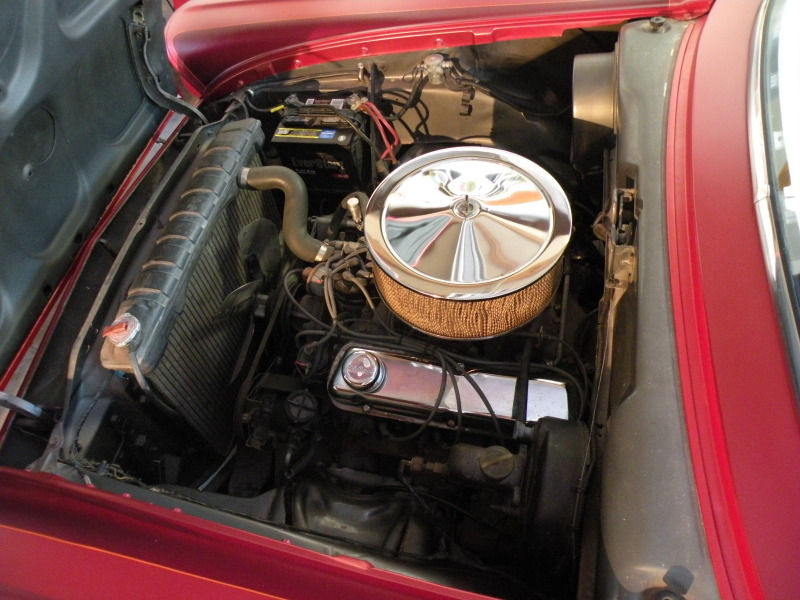 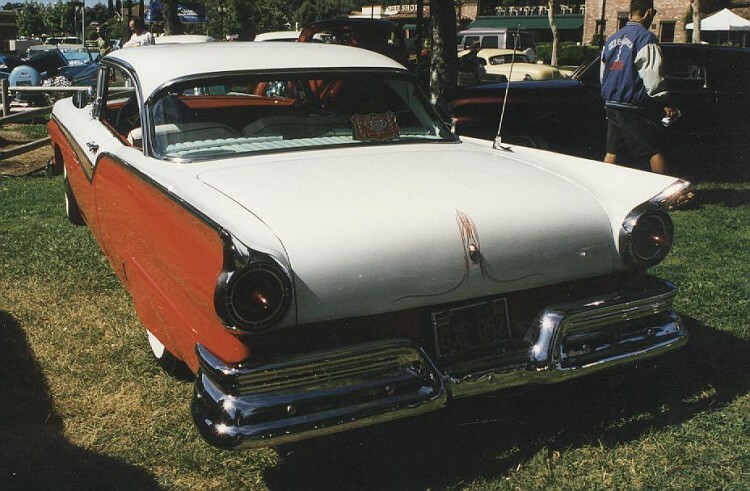 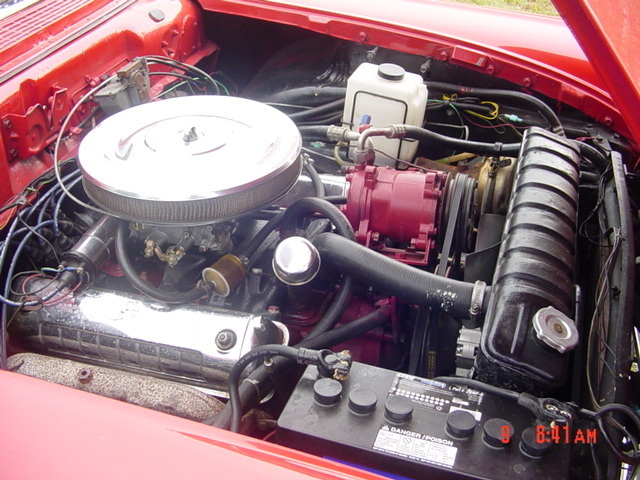 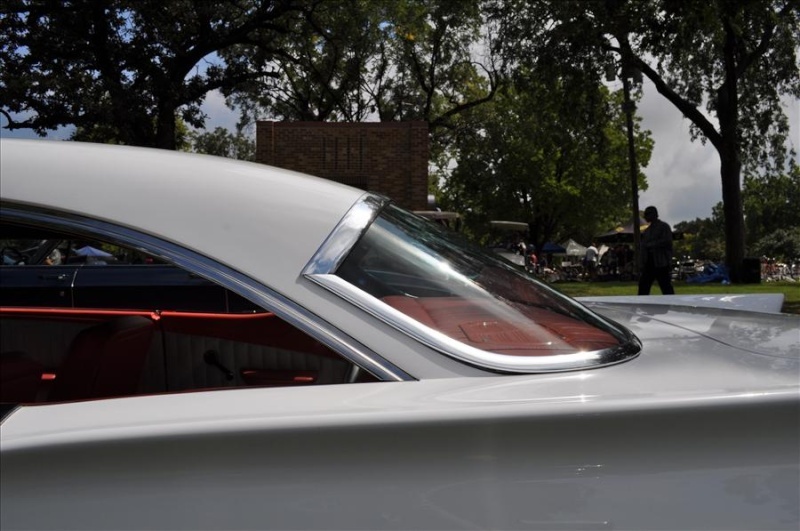 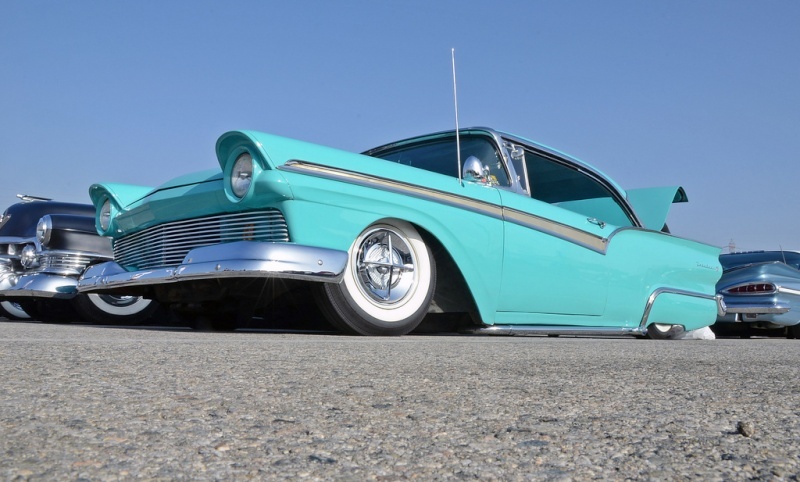 Ford hardtops are getting pretty darn scarce, so when I saw one at the Pleasanton swap meet for $5,500 with a fresh T-bird 312ci engine in it, I immediately called Don and advised him to buy it-NOW! 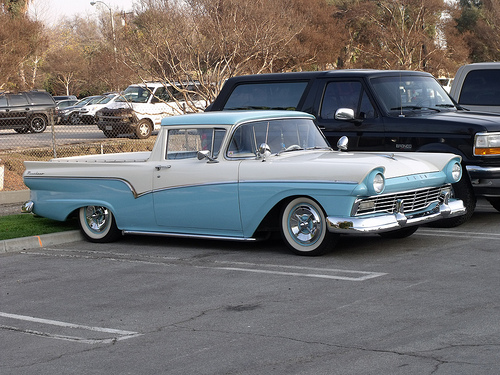 He didn't jump on it because the "timing wasn't right," or something like that. 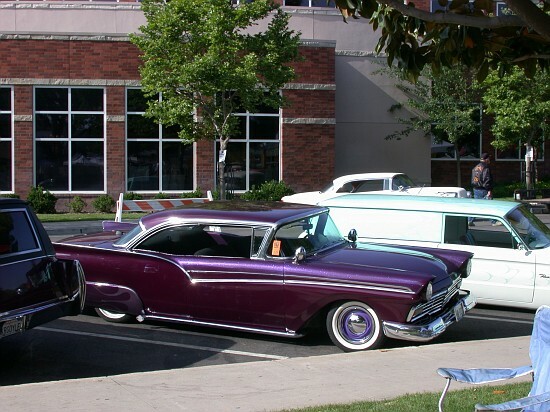 view larger imageThree or four months passed and I called the guy who had the car. 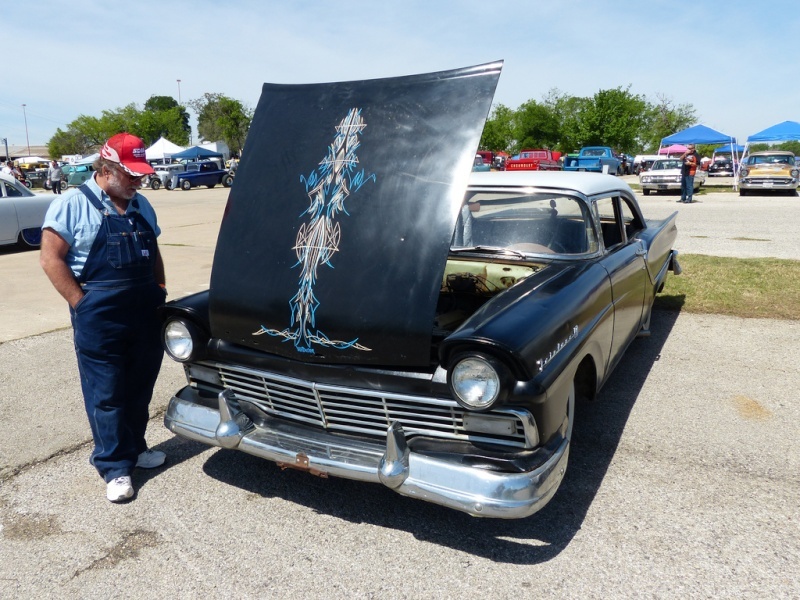 To my surprise, he had not sold it. 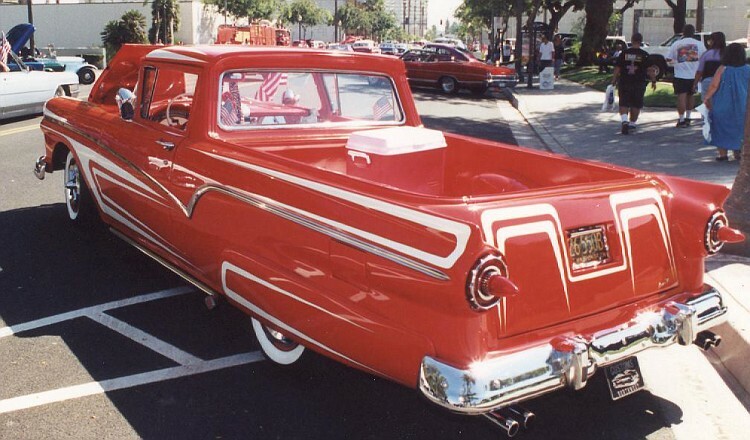 Well, I went to San Jose and bought it the next day. 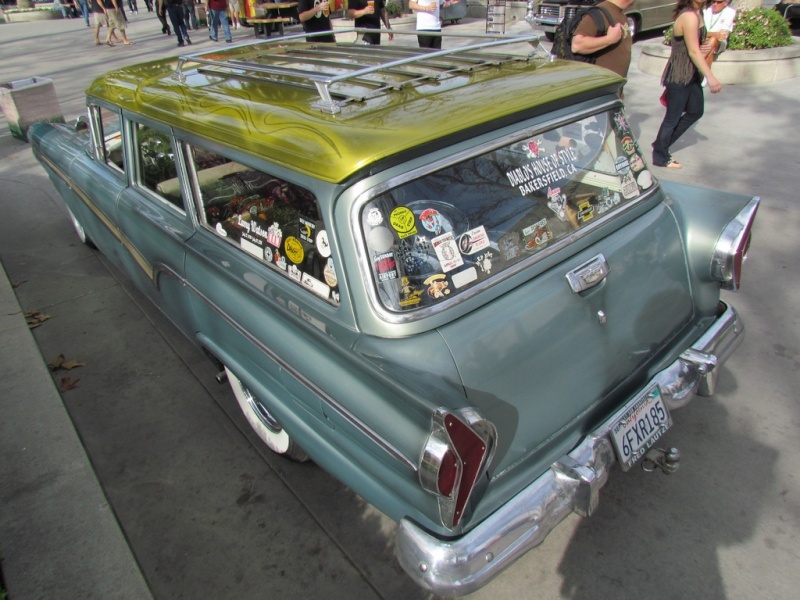 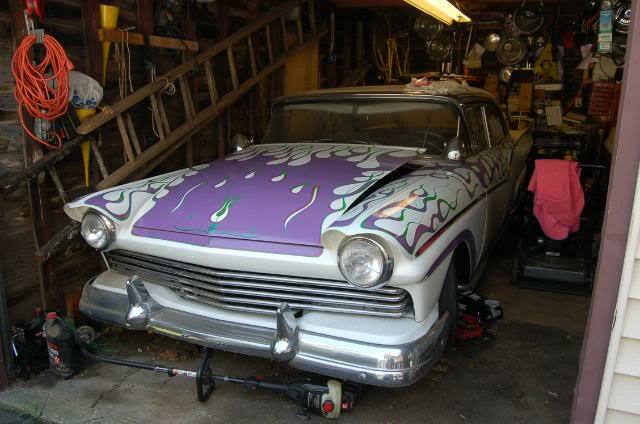 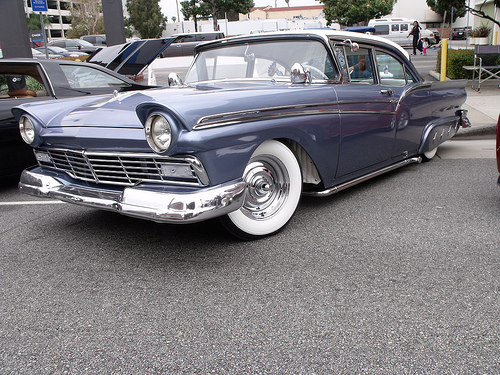 The car was all original and unmolested. 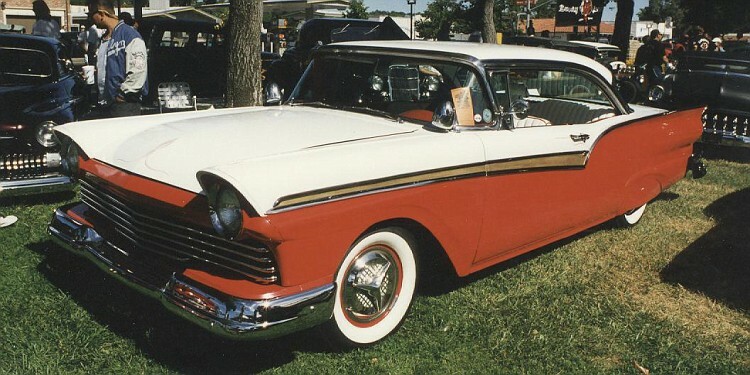 Next, I called Don's wife, Alberta, explained what I had done, and told her that if she would supply the money for the parts, I would build it. 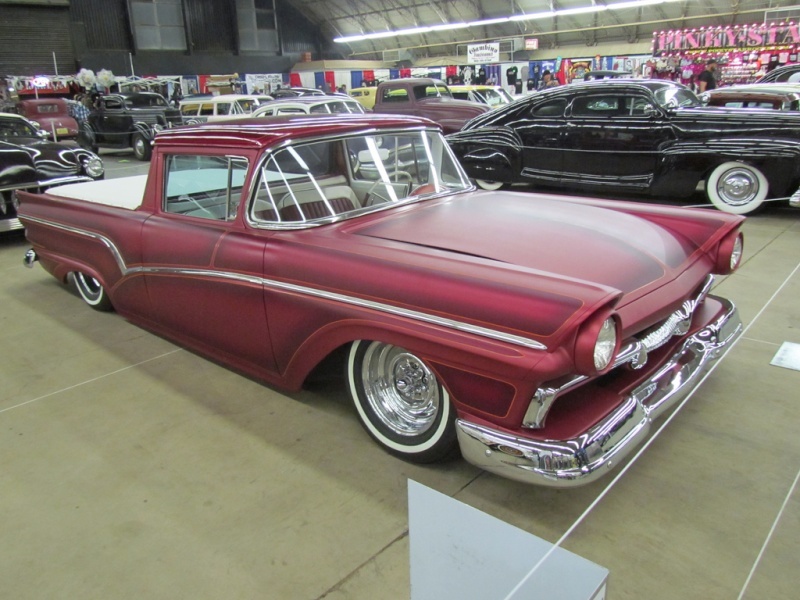 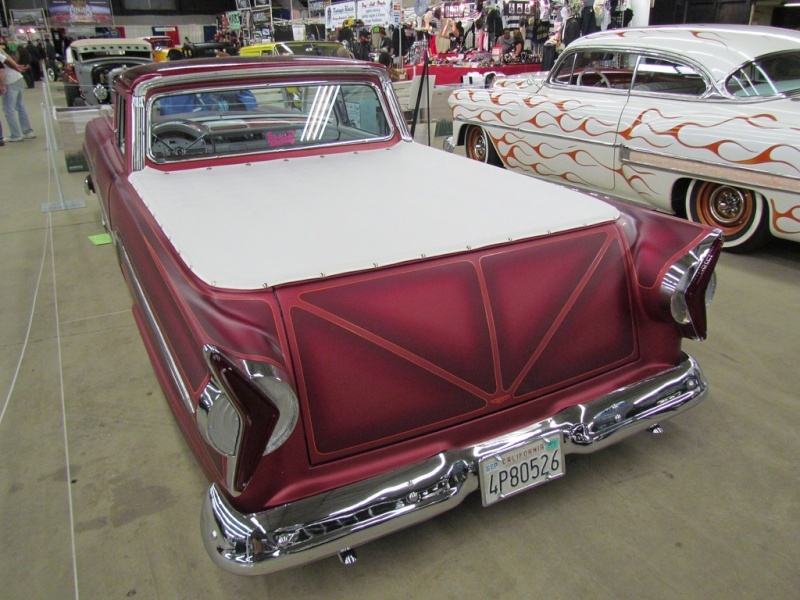 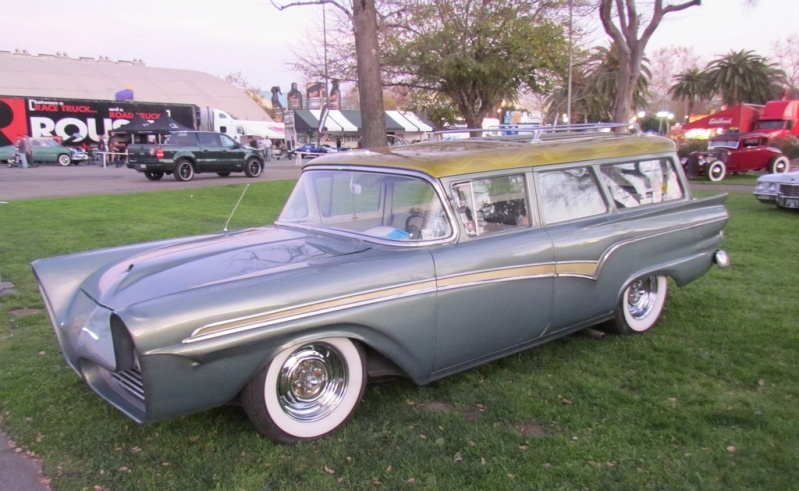 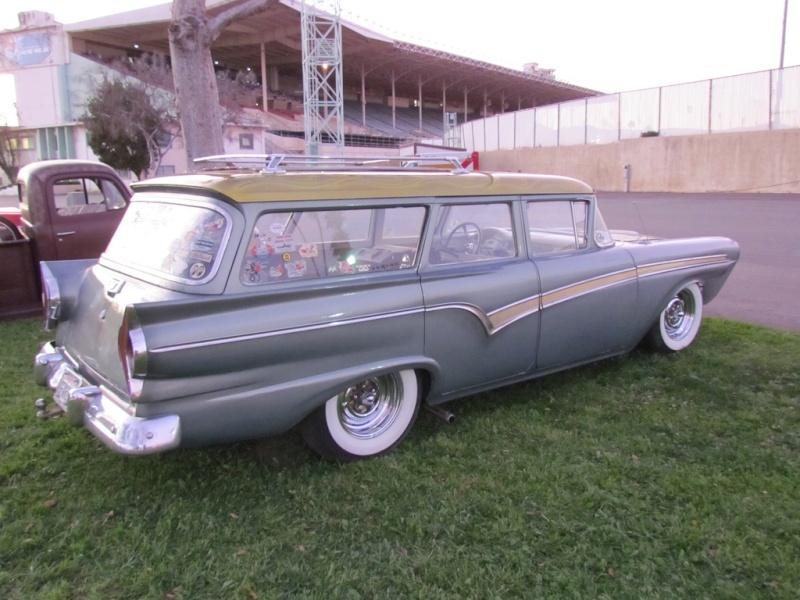 Our goal was to finish the car within six months so it could be presented to Don at the San Francisco Rod, Custom and Motorcycle Show in January 2005. 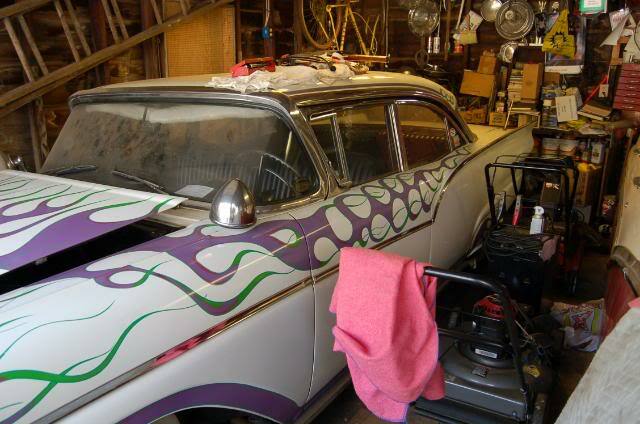 We got right on the project, doing the body mods and bodywork first. 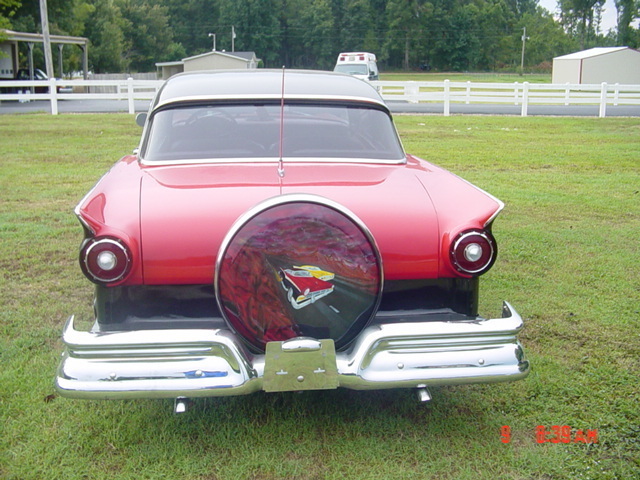 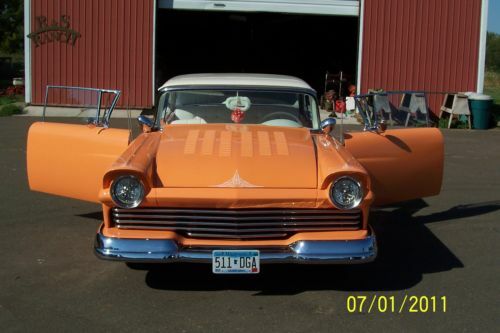 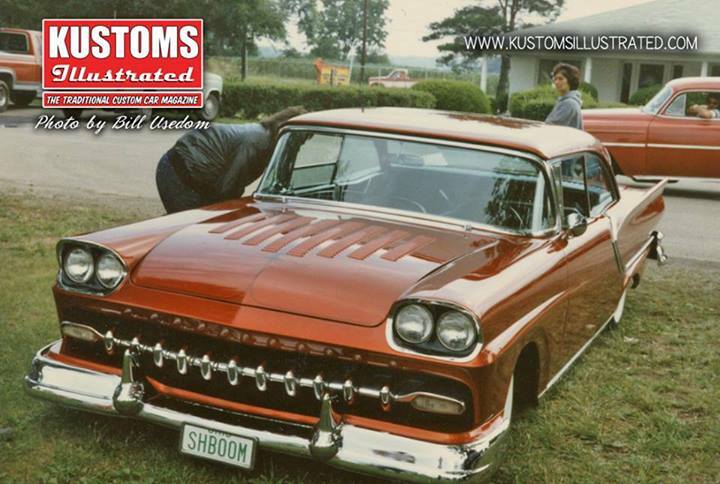 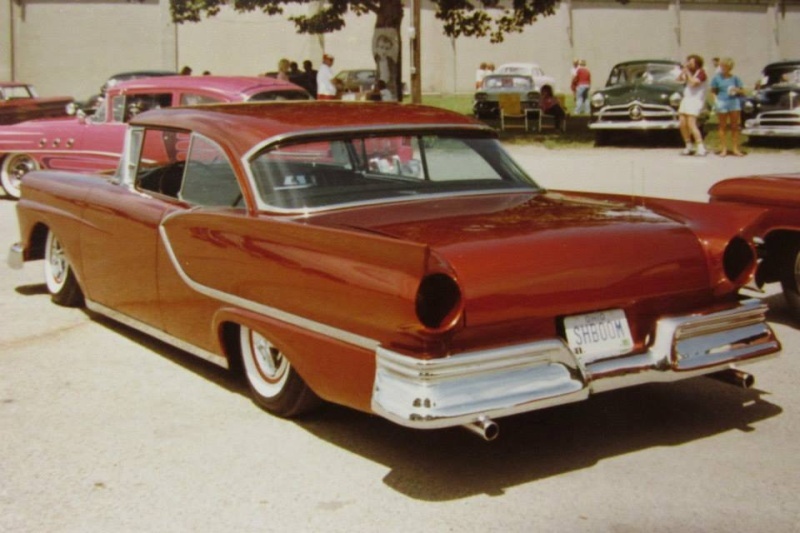 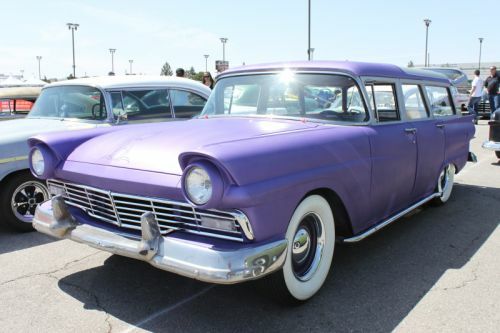 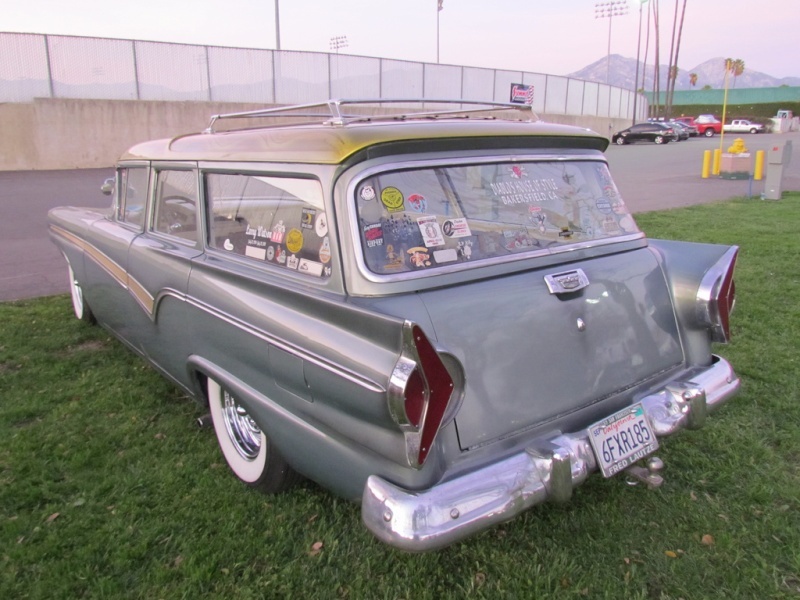 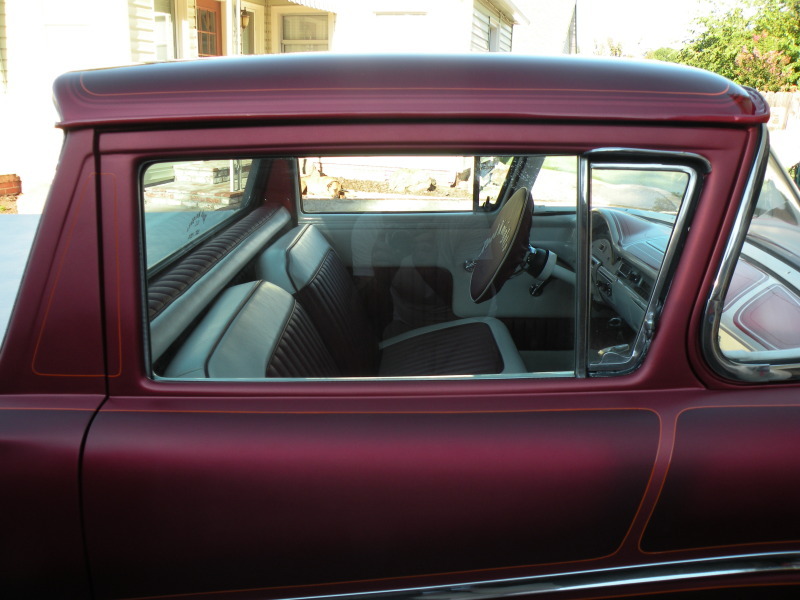 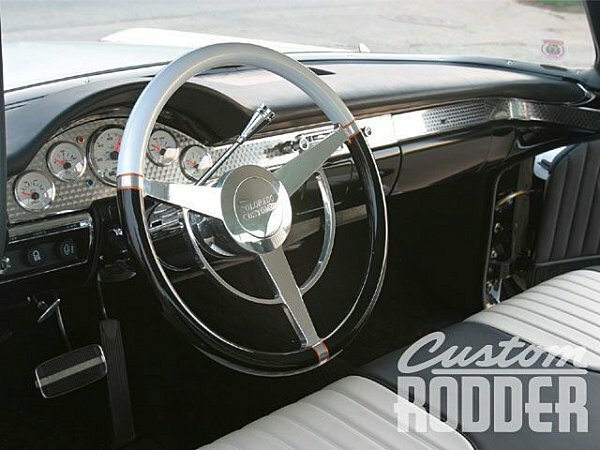 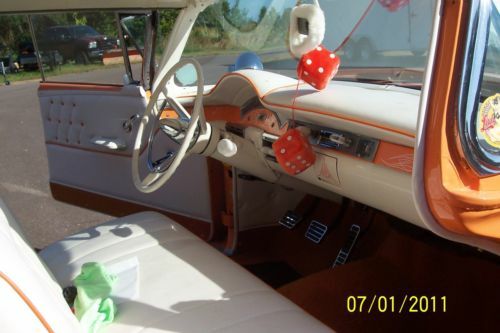 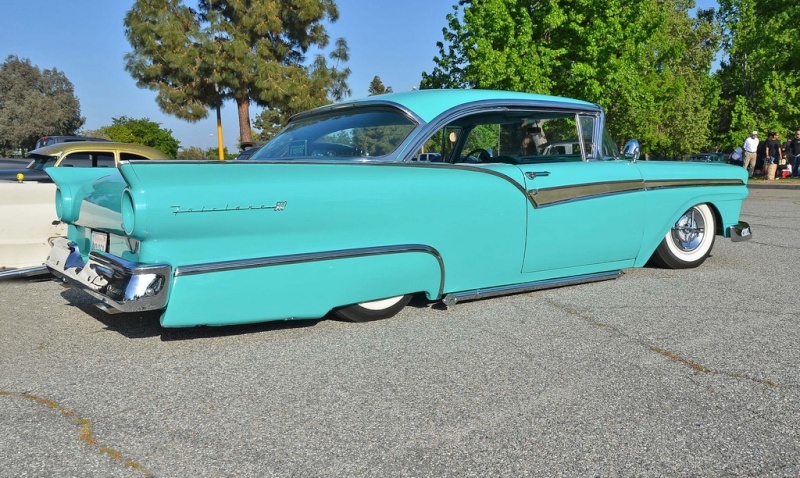 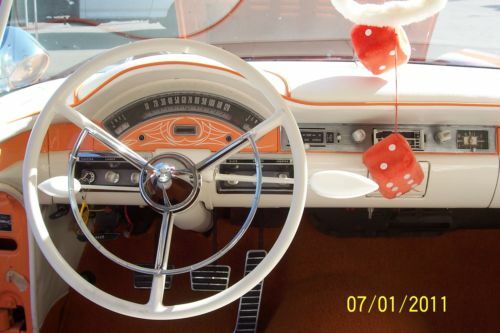 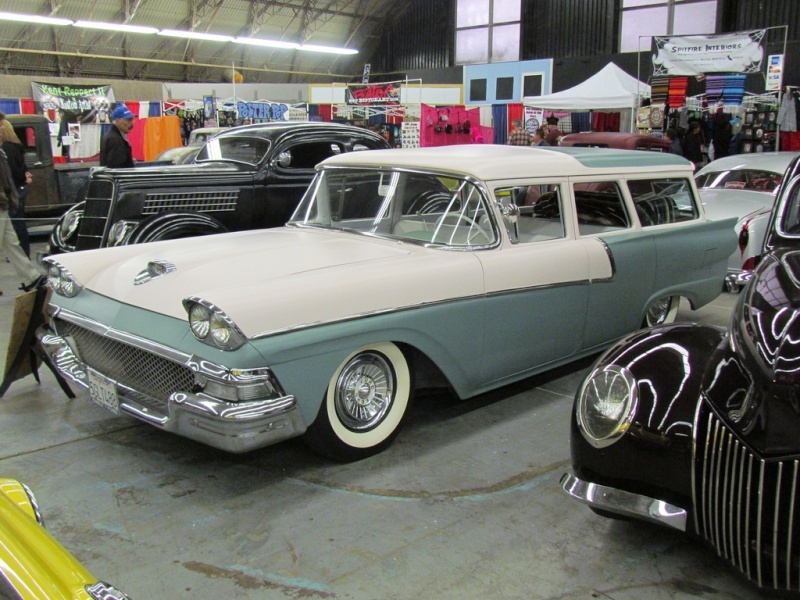 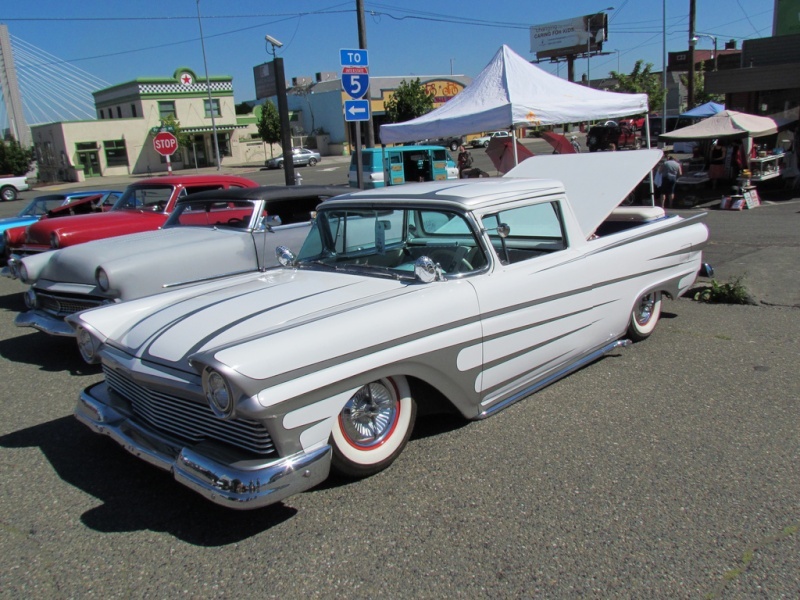 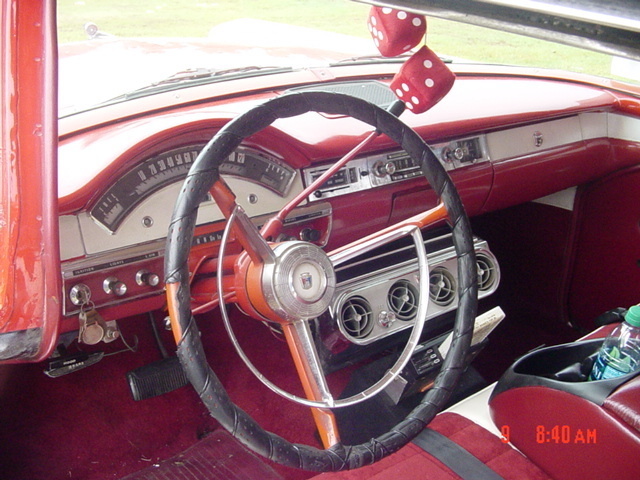 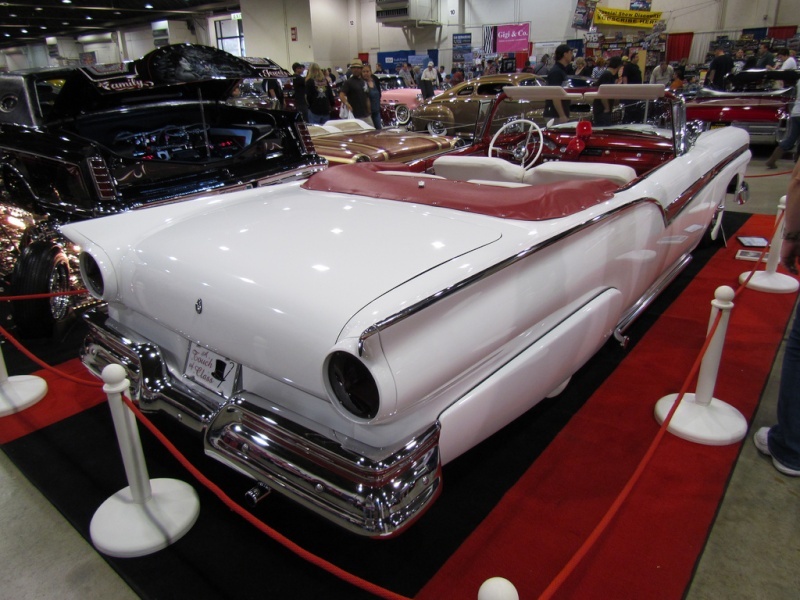 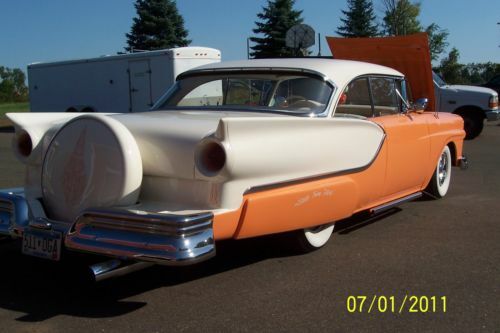 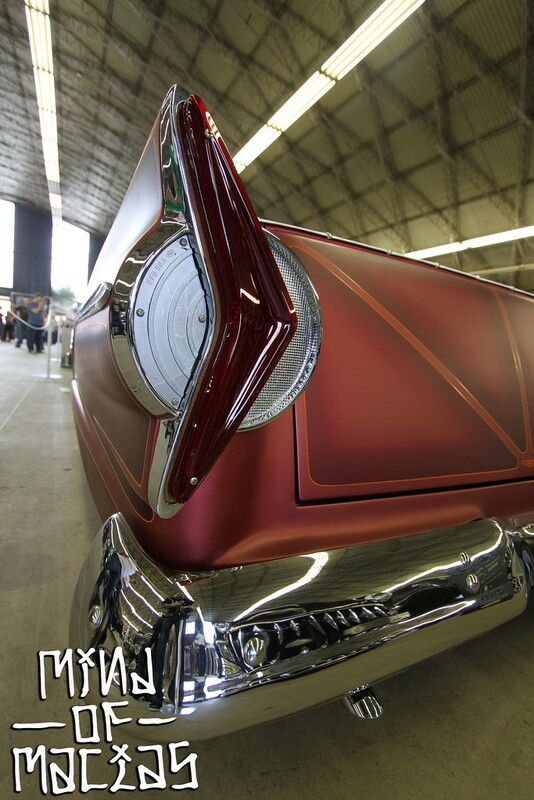 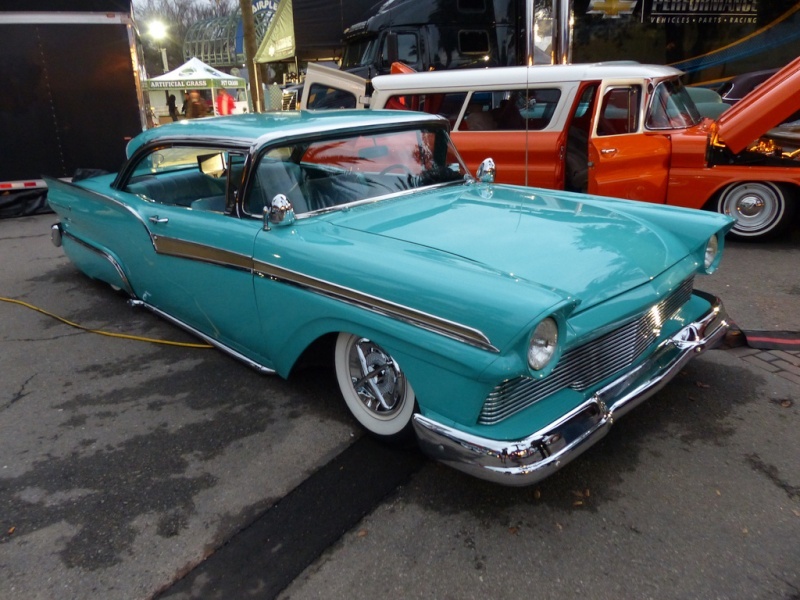 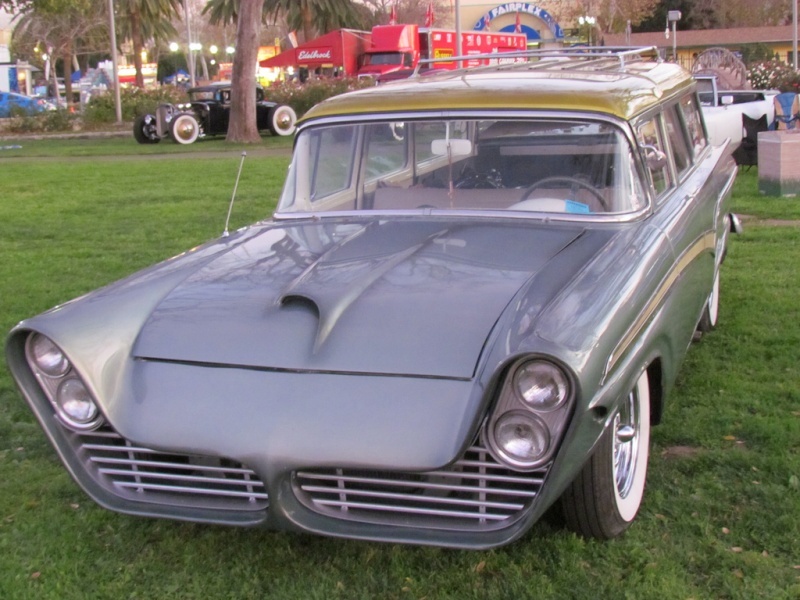 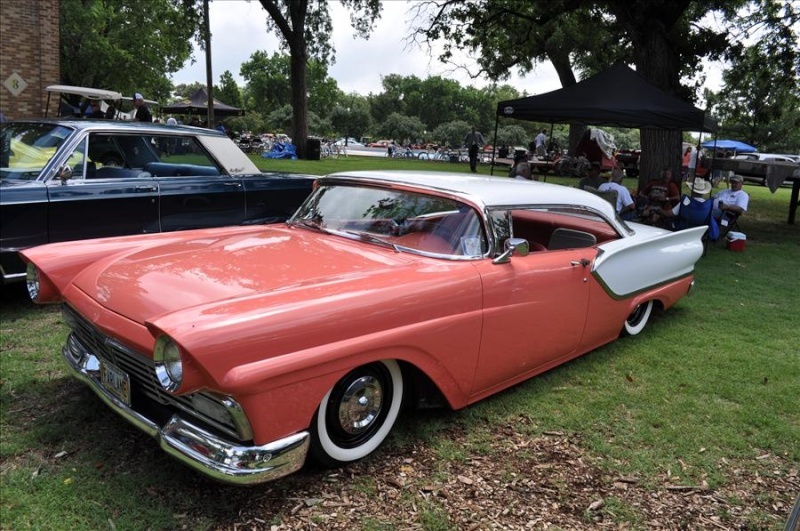 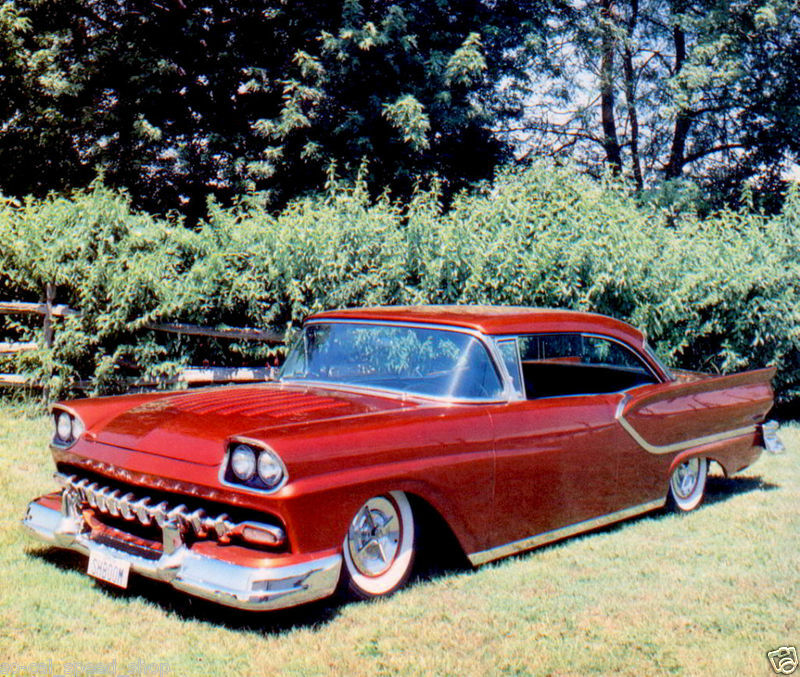 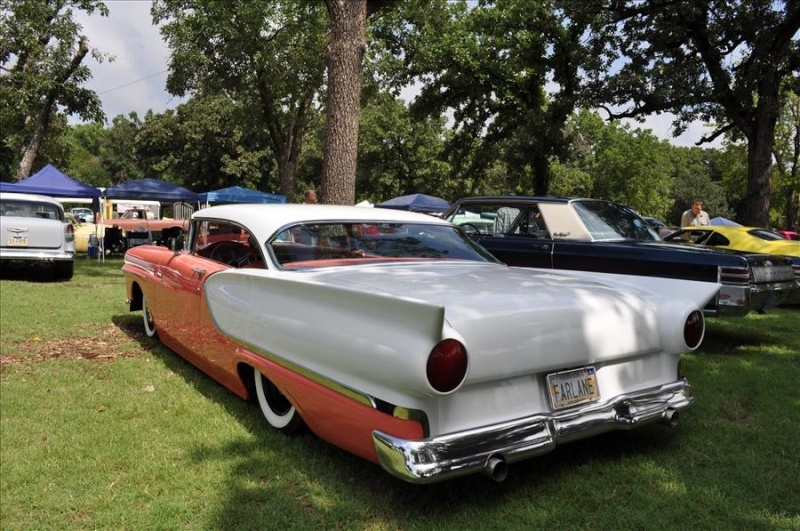 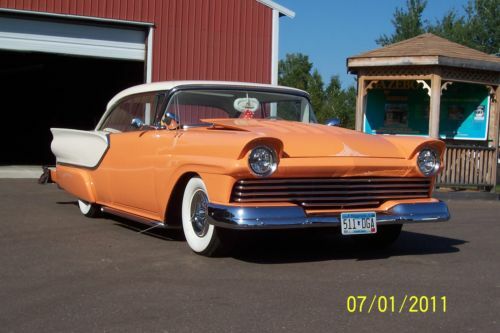 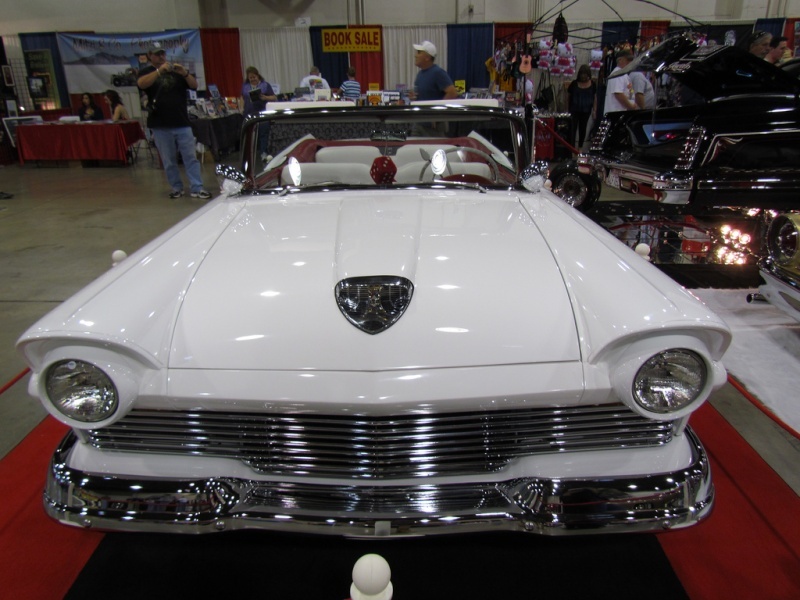 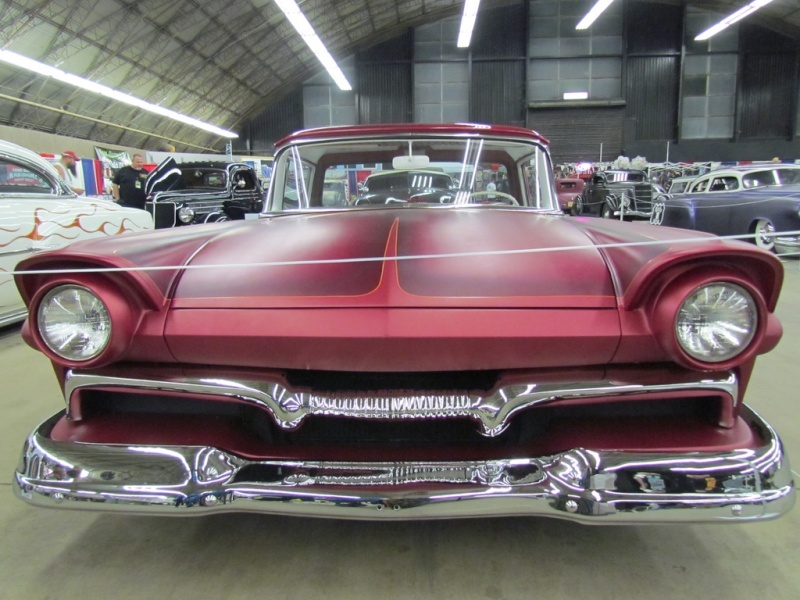 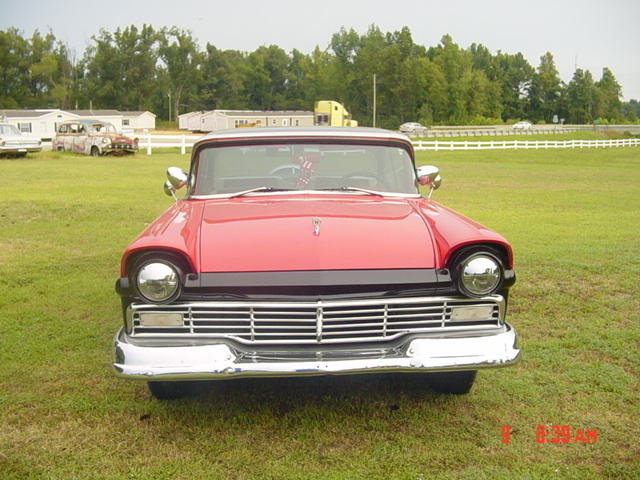 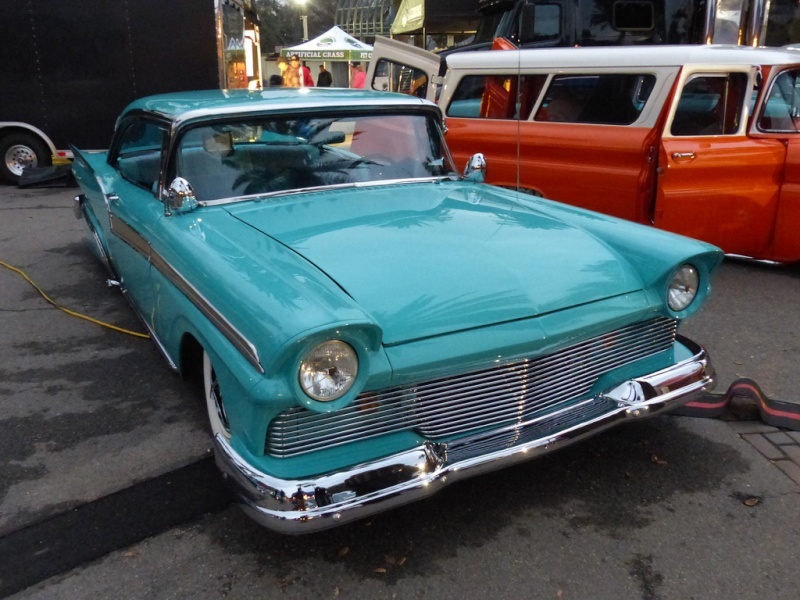 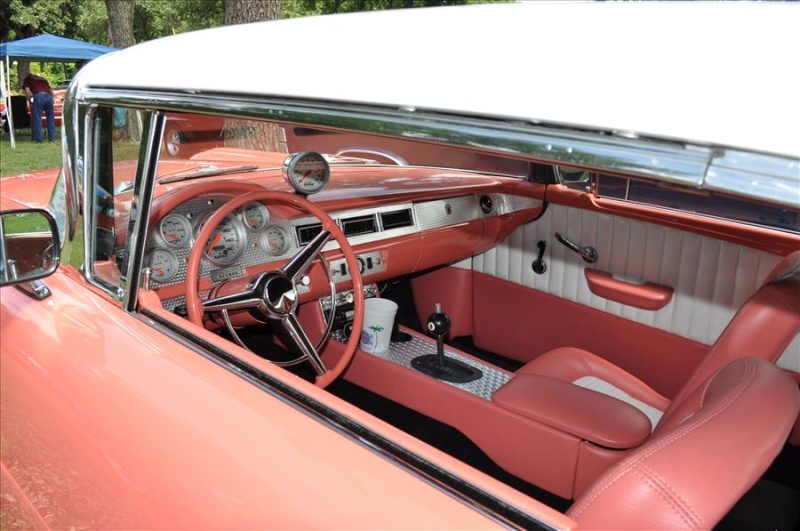 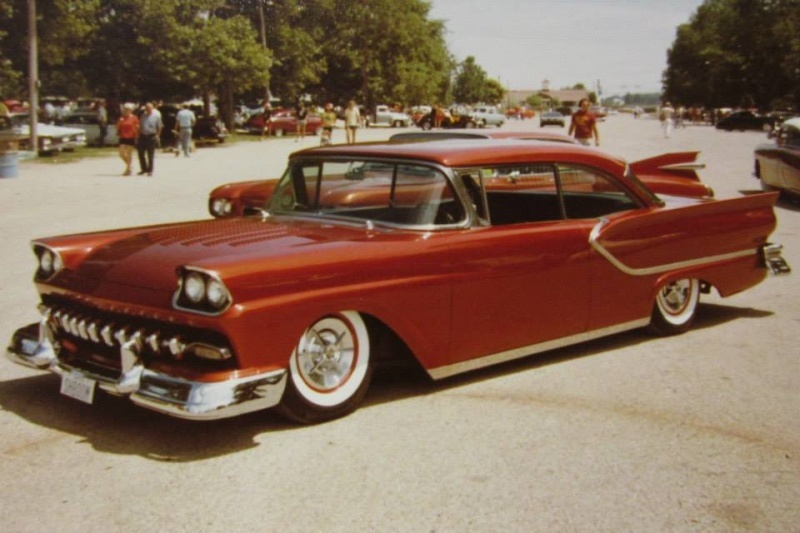 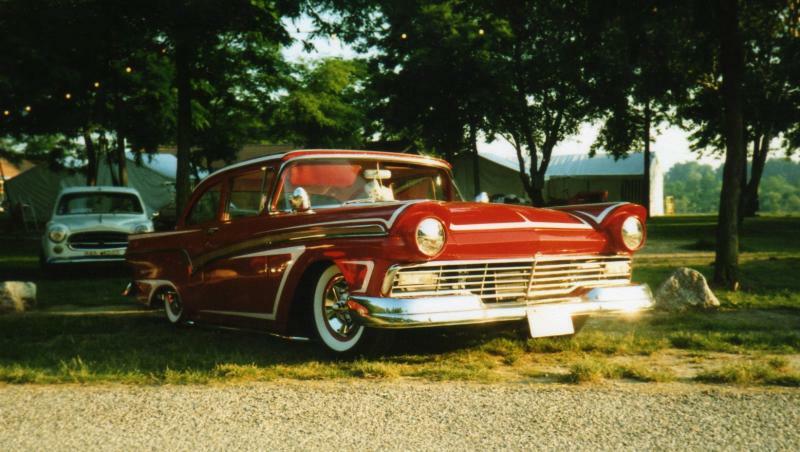 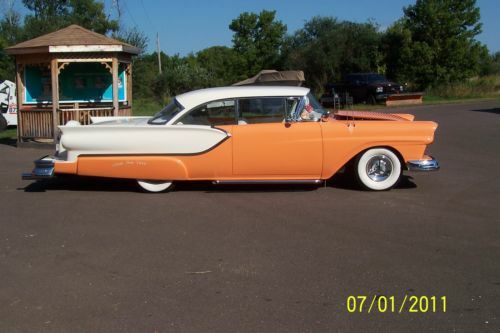 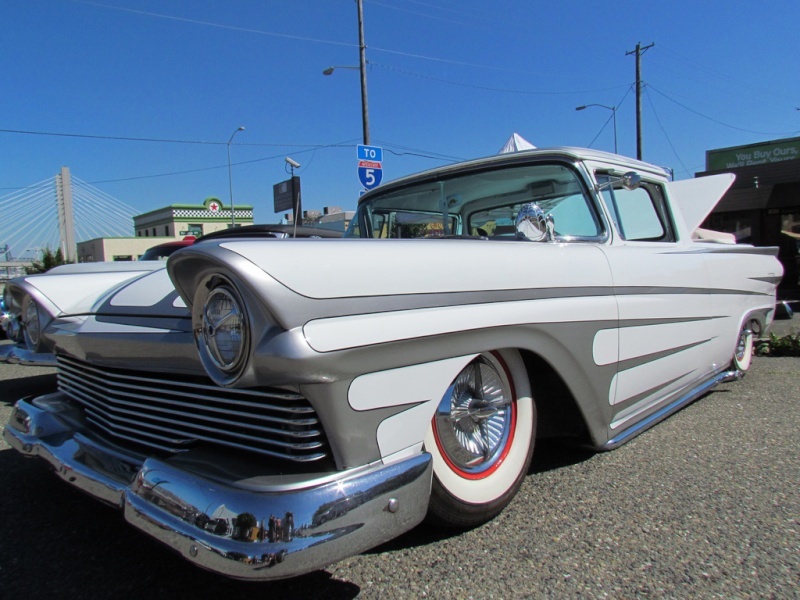 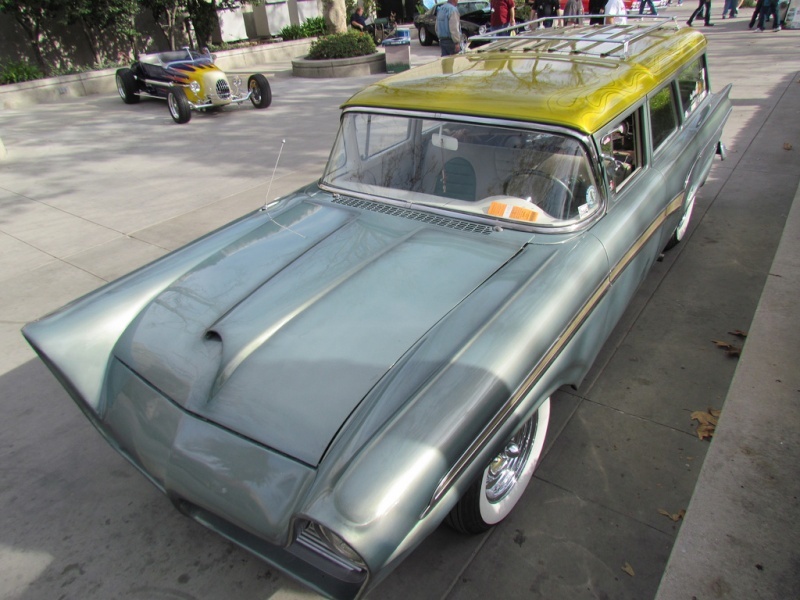 Our list of modifications included frenching the headlights and extending their eyebrows 2 1/2 inches, frenching '59 Cadillac taillights, installing partially shrouded lakes pipes, shaving the door handles and emblems, and fitting a new grille from Glory Grills. 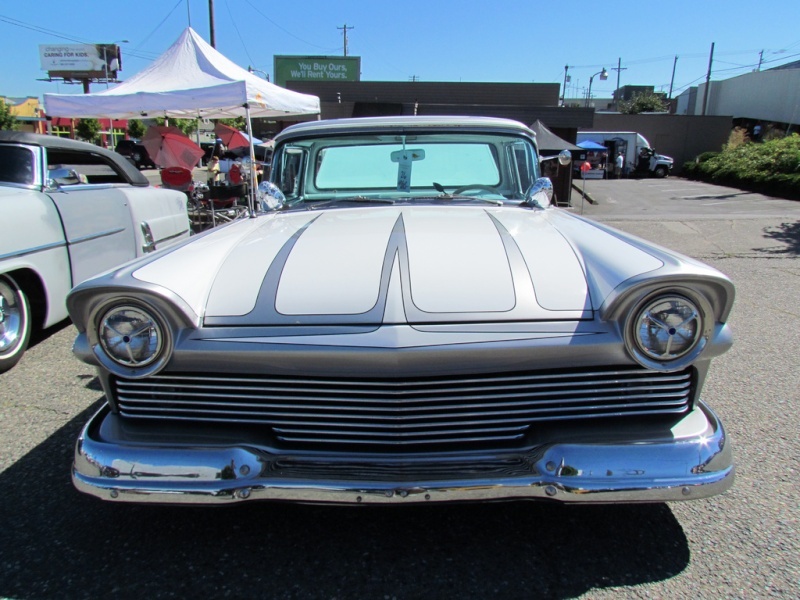 We narrowed the bumpers and sent them and the trim to Sherm's Plating for restoration and new chrome. 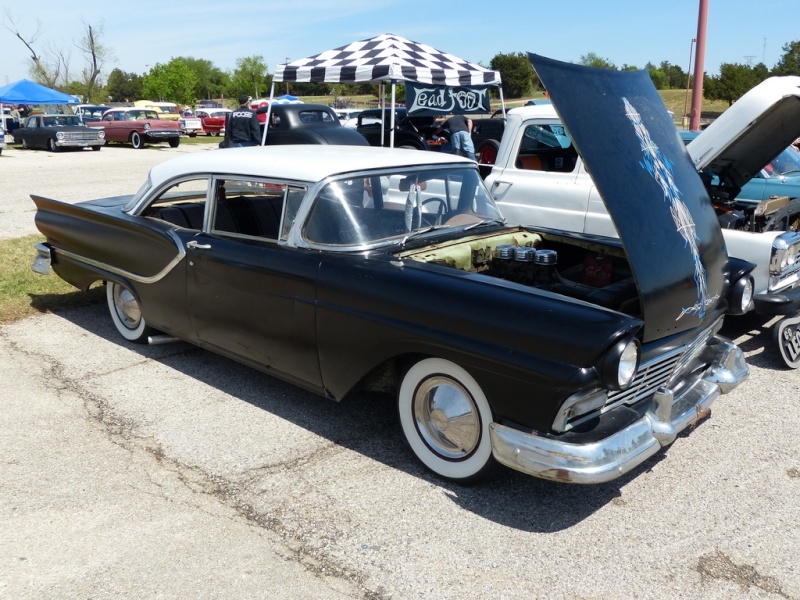 Then we raised the body, sandblasted the chassis, and upgraded it with a Saginaw 605 power steering box, sway bars, Granada disc brakes, custom front coil springs, and lowering blocks out back. 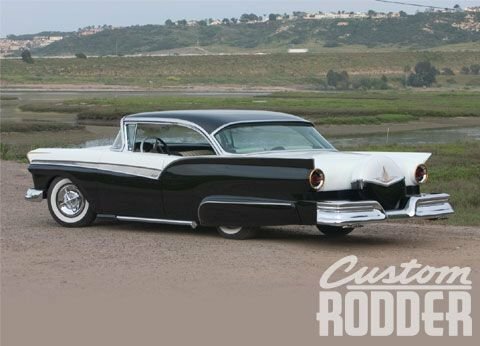 We eventually added Coker wide whitewalls, custom hubcaps, a Magnaflow exhaust system, and Mooneyes dress-up items on the rebuilt engine. 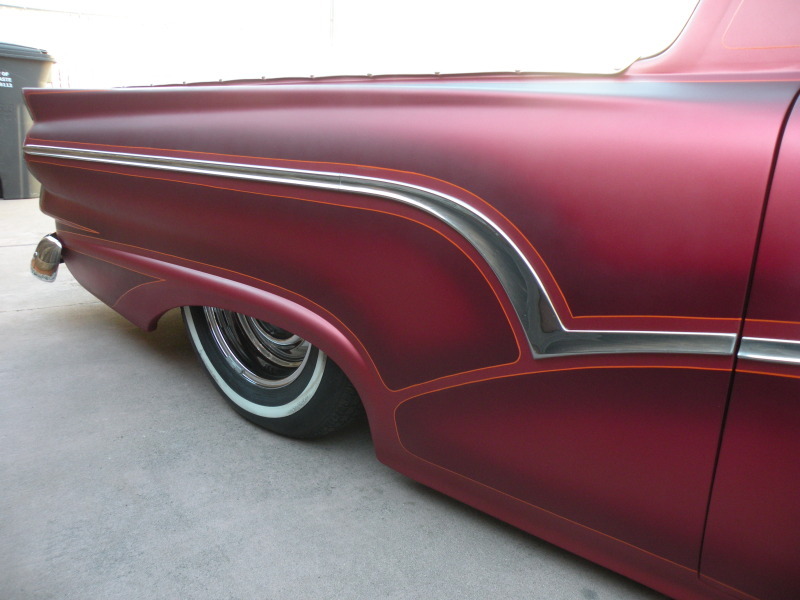 view larger imageAfter completing the chassis, we remounted the body and began the endless task of block sanding for perfection. 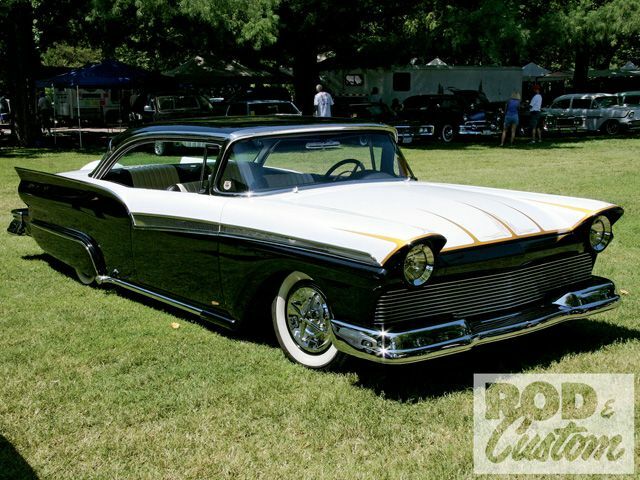 My partner at Tomz Kustoms, Tom Leman, laid down the specially mixed black and white paint. 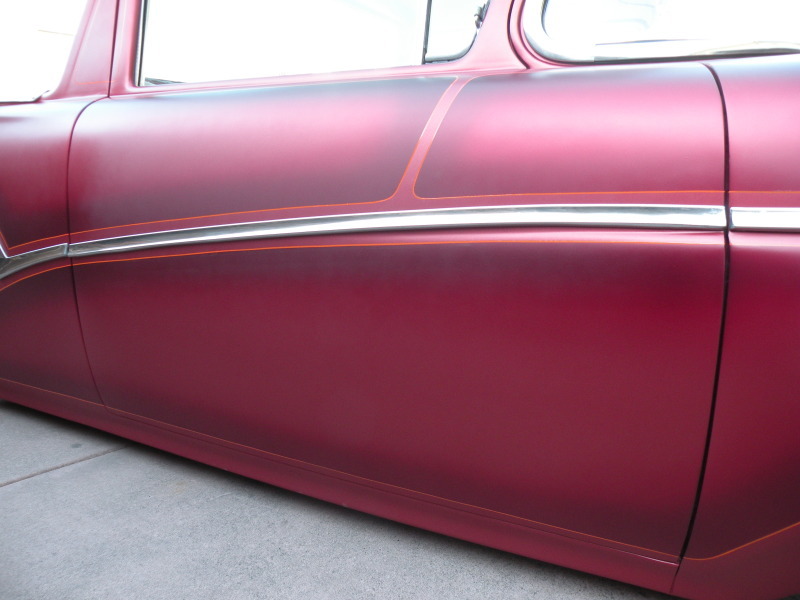 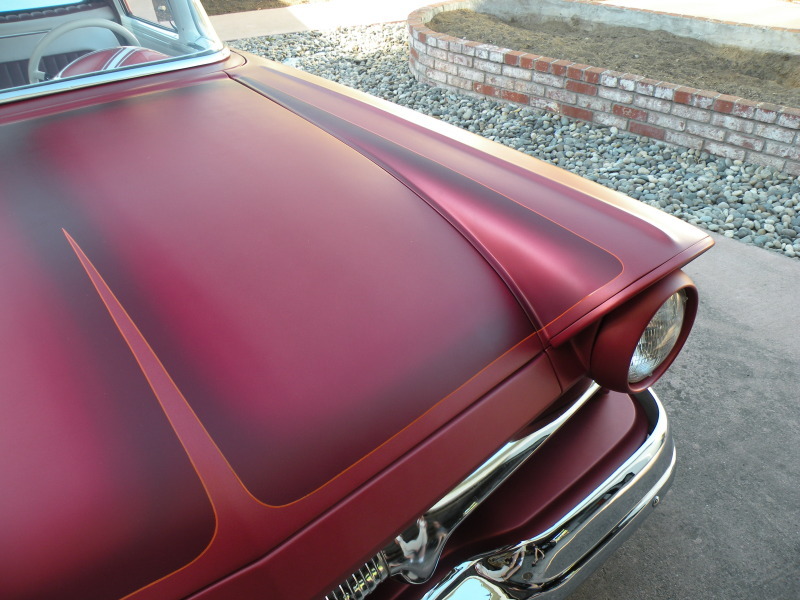 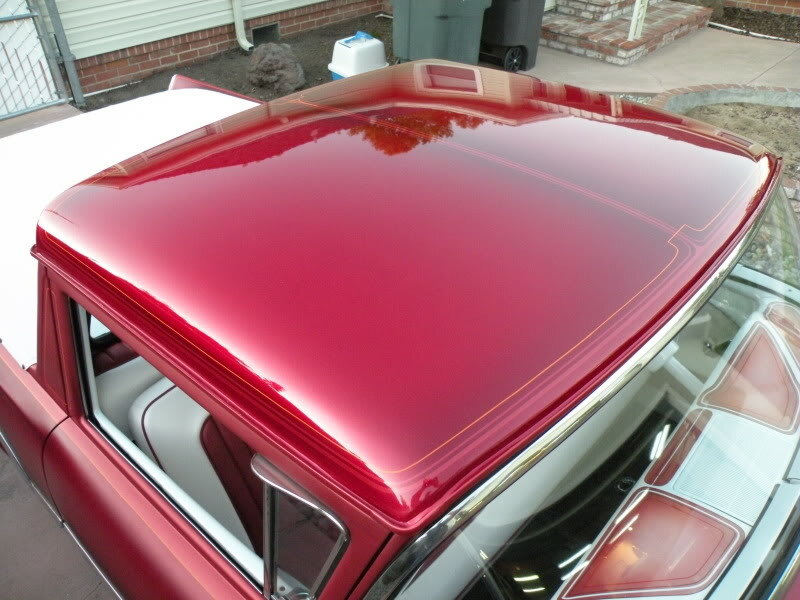 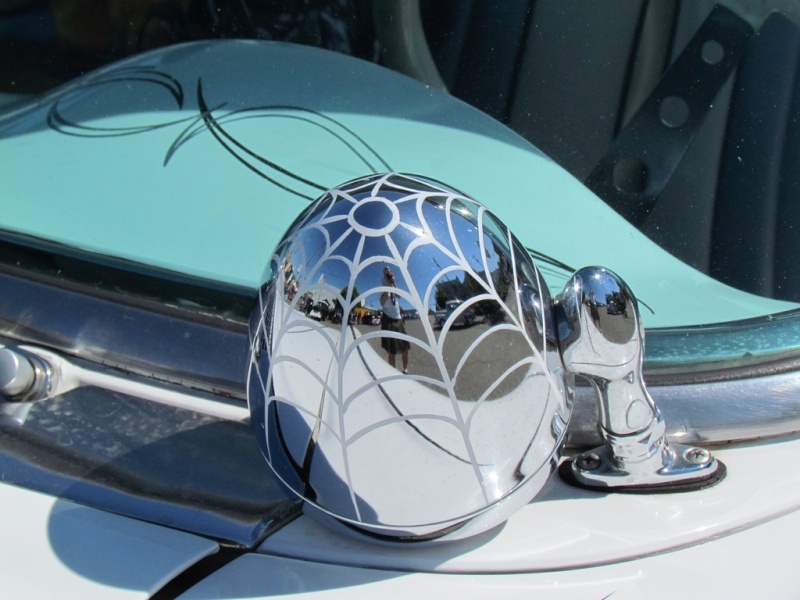 A company called Vitro Coat developed the paint effects by refining volcanic ash into a paint additive that increases image reflection and scratch resistance, and acts as a super dispersant for other solids in the paint (mirror chip and metalflake). 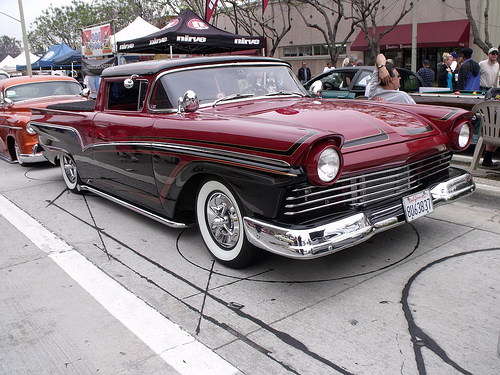 The black is one of the first blacks with an effect in it that does not dull the color to charcoal or gray, but instead sparkles several colors when the sun hits it. 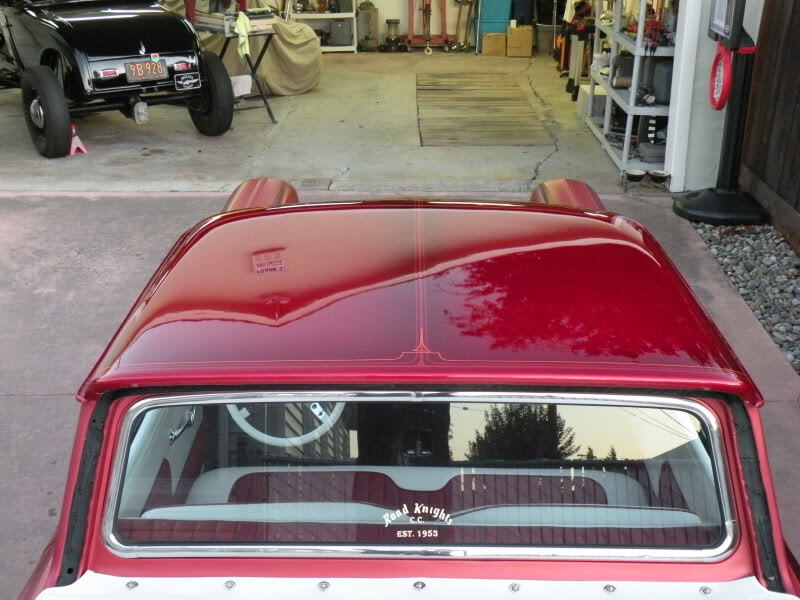 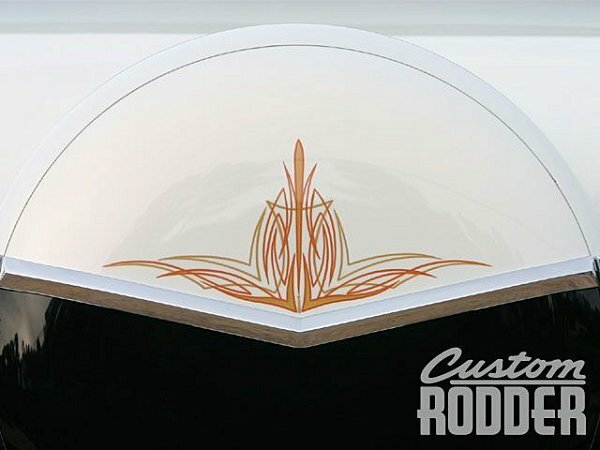 By the time my son TJ added gold pinstriping and scallops to the paint job, our deadline was looming, giving Barry Ward only a few days to complete the interior. 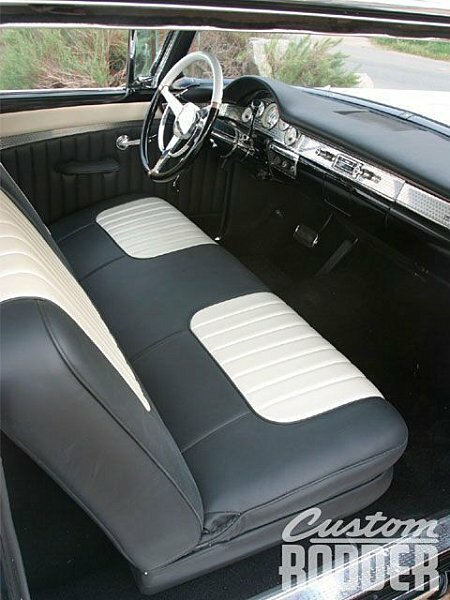 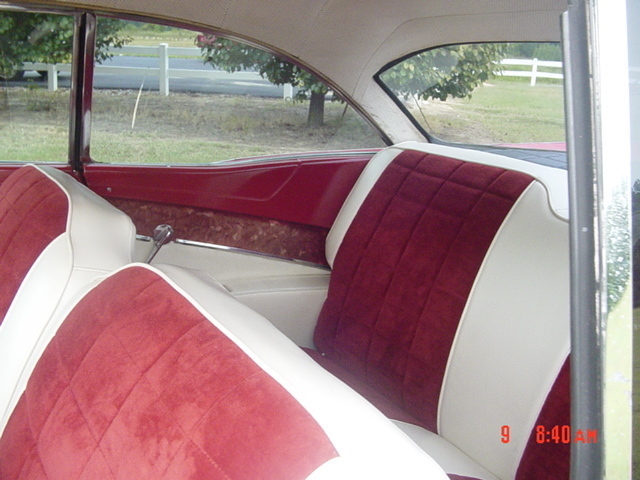 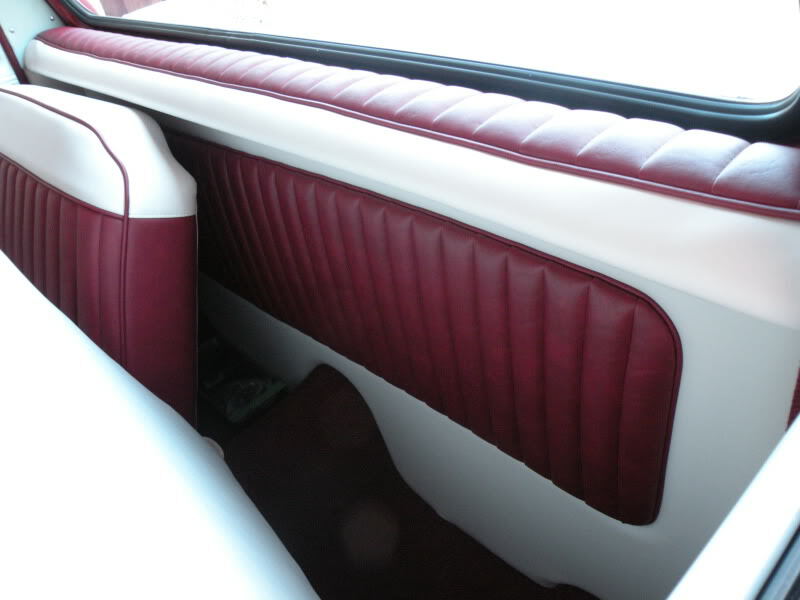 He did a great job covering the stock seats in black and white synthetic leather and incorporating engine-turned stainless into the door panels to match the Haneline instrument panel and dash trim. 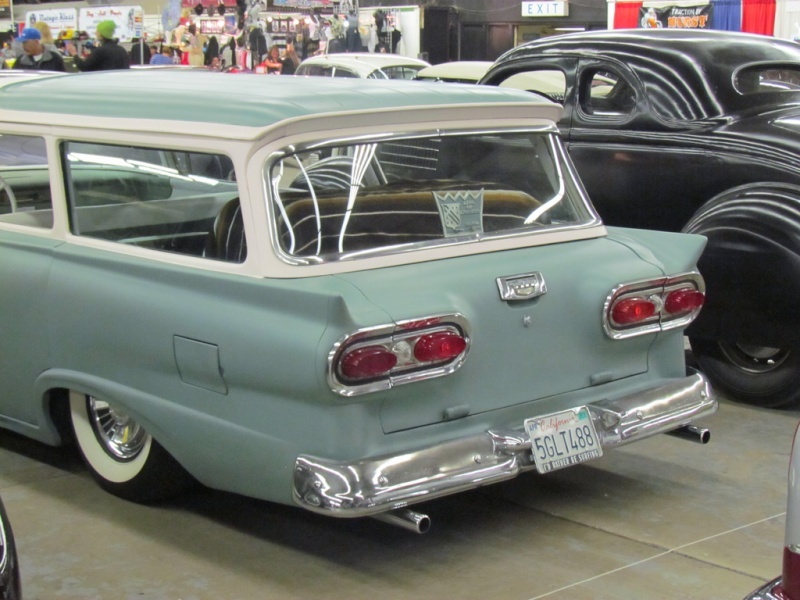 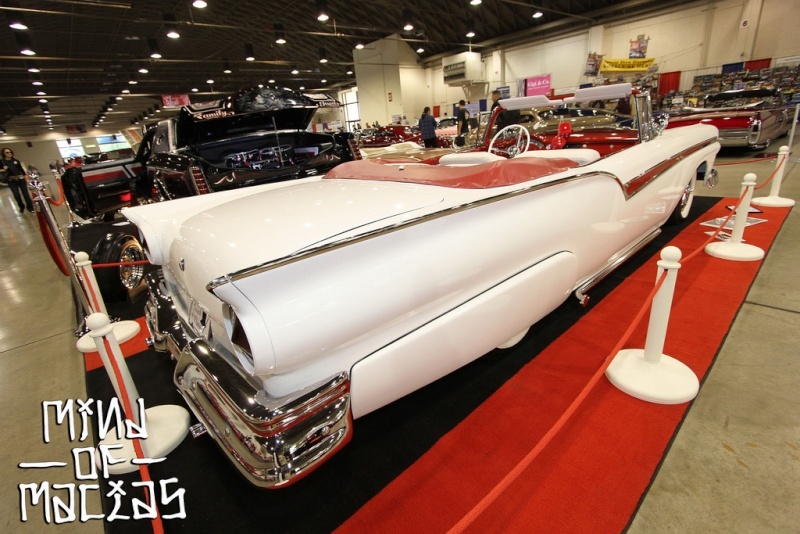 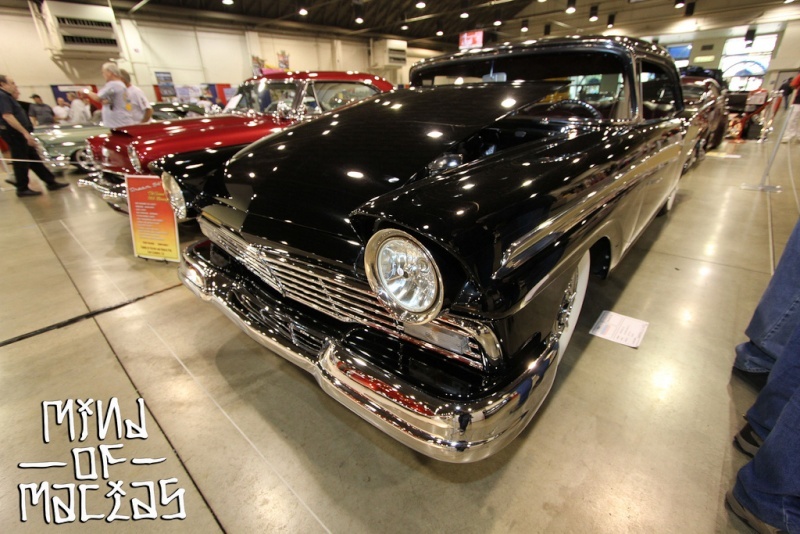 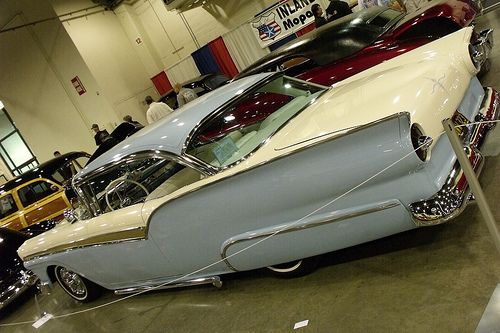 We worked night and day tending to all the final details (Vintage Air system, ididit tilt column, Colorado Custom wheel, Custom Autosound stereo), and finished the car just in time for the show. 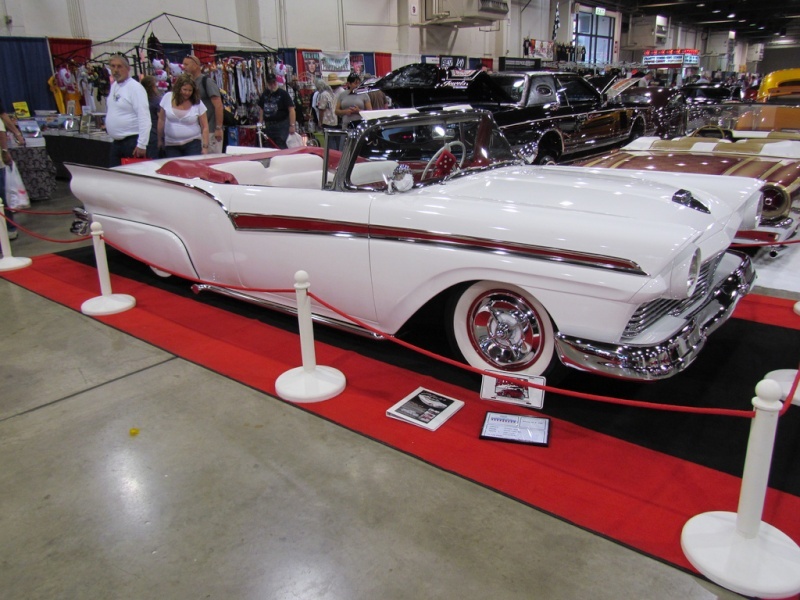 view larger imageAt the show on Saturday, we had a special presentation to surprise my brother with his new car. 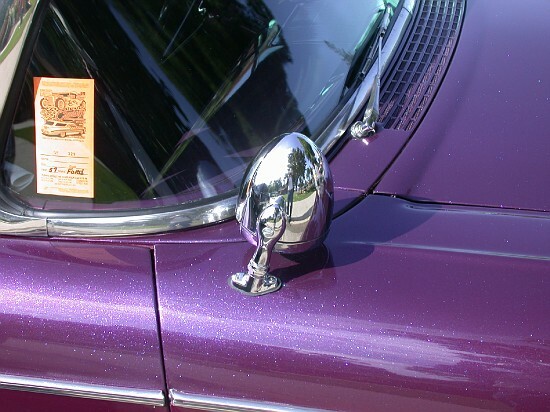 He had been admiring it for two days, not knowing it would be his. 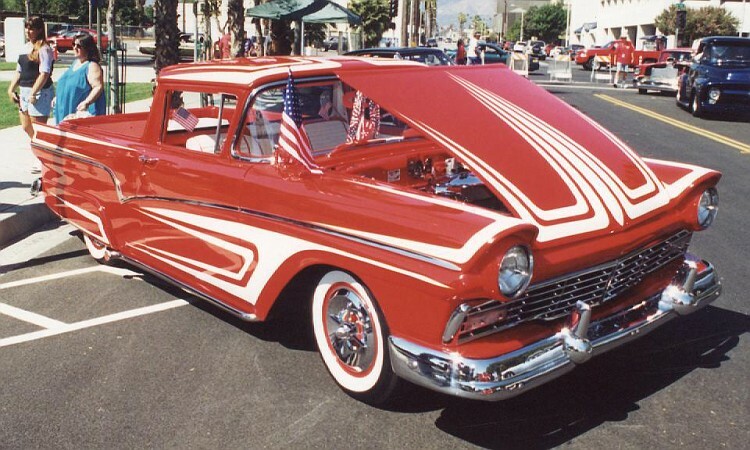 Now Don is back behind the wheel of a mild custom '57 Ford. 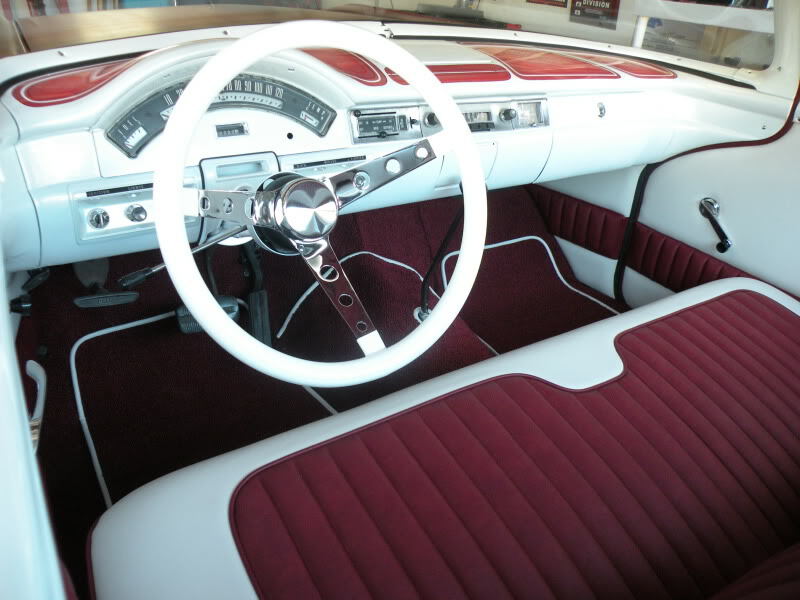 And me, I think I'm experiencing something I was a bit too young to feel in 1957-jealousy! 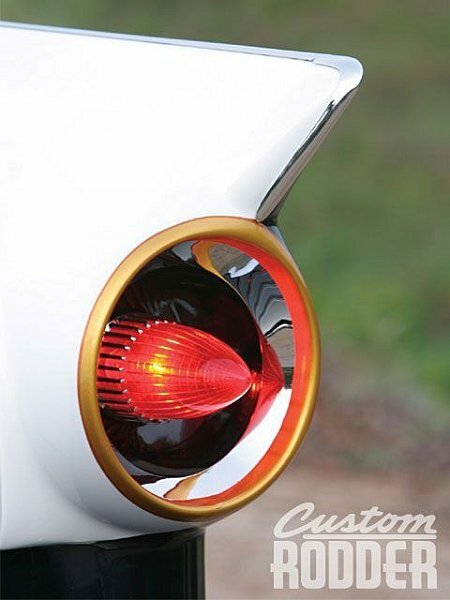 Pour l'anecdote cette caisse a été copié sur une Hot Wheels (édition limité) et pas le contraire. 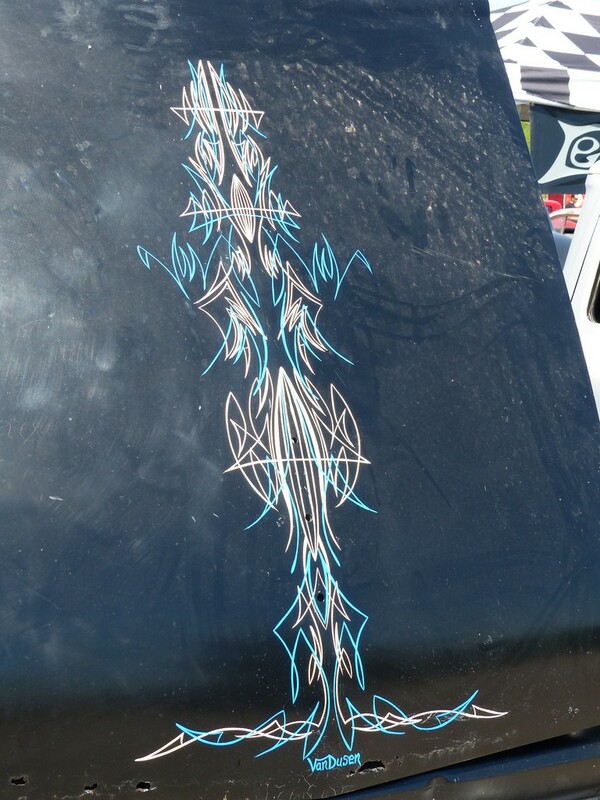 » 4x4 SUV custom de fou!